The collection is inspired by characters, consoles and 8-bit graphics. Vans loves working with iconic pop culture entities. To date, the company has released shoe and apparel collections inspired by Star Wars, The Beatles and, most recently, Disney. Now, as rumored, Vans has teamed up with Nintendo on a line of retro gaming sneakers and accessories for men, women and kids. 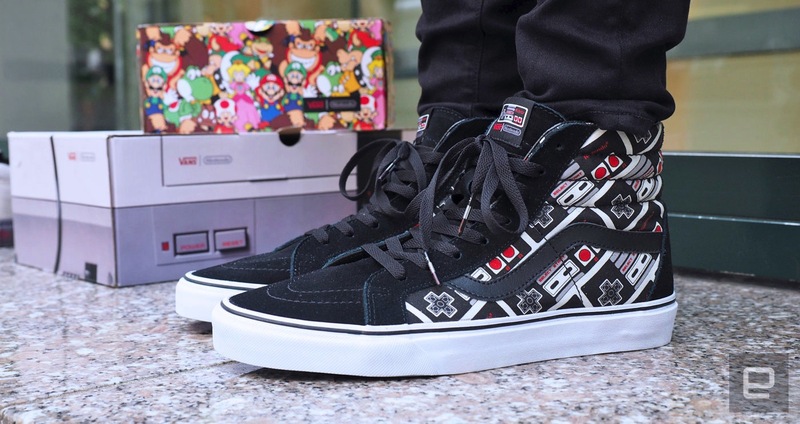 There are 13 different footwear styles, each featuring prints that pay tribute to Nintendo's first flagship console, the NES, as well as 8-bit graphics and characters from the Super Mario Bros. franchise. We checked out three pairs ahead of their June 3rd release and they look pretty fantastic on feet. More specifically, Vans provided us samples of the Controller Sk8-Hi (pictured in the lede image above), the Tie Dye Authentic and the 8-bit Old Skool. With some models being low-top and others high-top (not to mention colorful or minimalist), the collection offers something for everyone -- especially since most will be available in unisex sizes. A Vans spokesperson told Engadget that the Nintendo line will only be on sale for a short period of time. Prices are expected to range between $37 and $70 for the shoes, depending on whether you get an adult or kids' pair. They'll hit Vans' online store this Friday, along with select retail locations in various countries.